It was another full field of 40 golfers for our regular Monday venue of Green Valley, and the weather could not have been better. Captain Phil had the groups out smoothly as usual, and we were happy they allowed us an extra tee time at the last minute due to a few late entries the night before. Peter LeNoury was feeling in fine form and started his round with 20 points. That’s one heck of a start, but could he finish as strong in the afternoon sun? By the 15th things were looking good and at the end of the round he added another 22 on the back side to give him his second best round this year. Well played Peter, there’s nothing better than a strong finish! 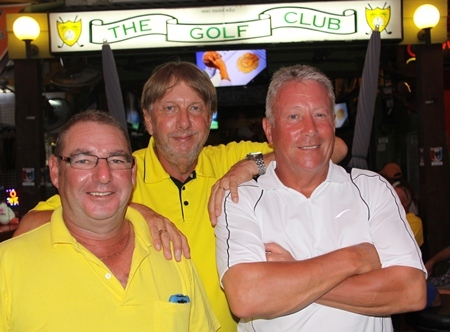 Micky Beresford, Peter LeNoury and John Walsh. Sorry Micky, on most days that 40 points would easily have been good enough for a win, but today you must settle for only second. Visiting Englishman John Walsh has hopefully had his spirits lifted a bit by today’s result. I think this is his best round this trip, and maybe he can put the England rugby loss to Wales behind him now. Great scoring guys! Ken Aihara with Ian Ashenden and Captain Phil. Ian, who obviously plays off scratch, has christened Ken as “Up and Down Ken” and he stated that he has never seen an amateur… or pro for that matter, play his short game as well as Ken played against Ian on this day. Ken had 2 lovely chip-ins from off the green to leave Ian feeling just a little bit stunned. This brings back memories of Ian and Mark Haffenden getting edged out by Serge last year! Kenny-chan is a very consistent golfer, no easy feat around here, and if you have been reading this column with any regularity, he is known not to be a long hitter of the ball. He does however make up for that by having a short game that is second to none. There’s hope for us all! Captain Phil rounded out the 3-ball and had a very entertaining afternoon indeed. 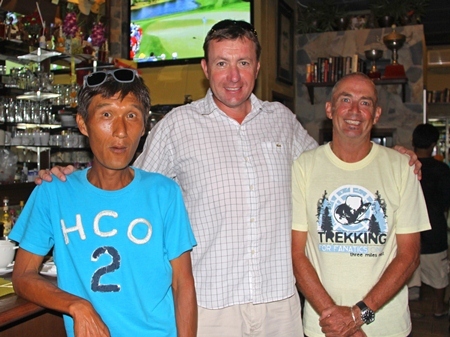 Mike Newbert & Brett Chan with Ken Aihara & Phil Smedley at Burapha. If you ever have the chance to play golf in K-L, look up our mate Ian and play the best course that nation has to offer, and buy him a beer for commiserations! Well, we just had to have a quick note of congratulations to our lads from The Golf Club after our 2-man scramble teams of Phil Smedley and Ken Aihara (63.8) took third place, and Mike Newbert and Brett Chan (65.2) took fifth in the annual PSC Charity Classic. Well played lads, ya done us proud! 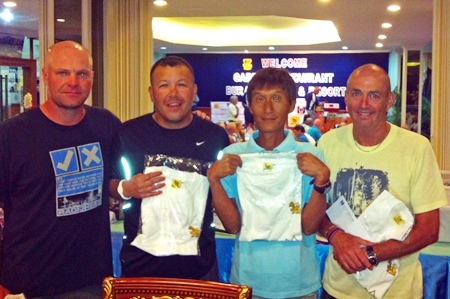 For full details, please see the big write-up on the PSC Charity Classic on page 54. Note: The Golf Club is located on Soi LK Metro. We usually play on Monday, Wednesday and Friday so come join us for a seriously fun day out. 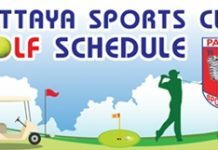 Just call 085 434 3377 or see our website www.golfclubpattaya.com and for more information mail us: [email protected] gmail.com and see updates at www.facebook.com/golfclubpattaya… all handicaps welcome!